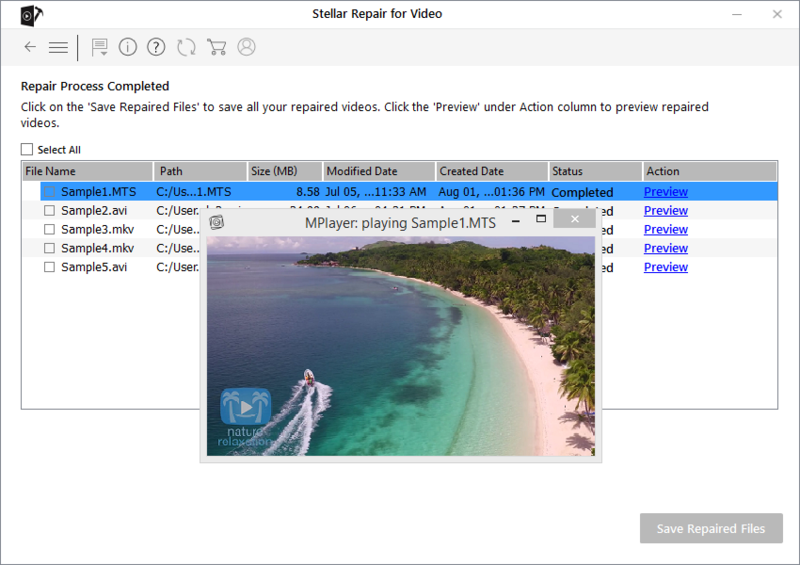 Stellar Repair for Video lets you repair corrupted or damaged video files from storage media like flash drives, memory cards, hard drives and external hard drives. Some of the most common causes that lead to corruption in videos are changes in file format, file header corruption, improper system shutdown, file read and write errors, virus attacks, incomplete download and compression issues. Stellar Repair for Video repairs multiple video types, like AVI, ASF, WMV, MKV, FLV, DIVX, WEBM, MJPEG, MPEG, AVCHD, MTS, MOV, MP4, M4V, 3G2, 3GP, and F4V. You can preview the repaired videos before saving them to the computer. The software has a new and enhanced GUI. The software repairs corrupt videos using the Sample File. Support for repairing of AVI, ASF, WMV, MKV, FLV, DIVX, WEBM, MJPEG, MPEG, AVCHD, MTS, MOV, MP4, M4V, 3G2, 3GP, and F4V videos. Repairs corruption in the header of video files. Repairs corruption in the sound section of video files. Repairs errors in movement of videos. Repairs corruption in video frames. Repairs errors in video slider movement. It provides a preview of repairable video files. Repairs corrupted data of video files. The user interface contains buttons that help you access various features of the software with ease. This button is on the home screen of Stellar Repair for Video. Click it to add video files for repairing. To expand the list of more options provided by the software, click on this icon. This button displays you the About section of the software. Click this button to open the user help guide. Click this button to buy Stellar Repair for Video software. Click this button to change the software language. Click this button to activate the software after purchase. Click this button to check for both, latest minor and major versions available online. Click this button anytime to move to the previous screen of the current screen. Click this button to stop the process. This button allows you to add video files to the list of video files. Click this button to preview the selected files. This button starts the repairing process. Click this button to save the files which have been repaired. The demo version is for evaluation purpose only. You need to activate the software to use its full functionality. Use the Activation Key received via email after purchasing the software to activate it. 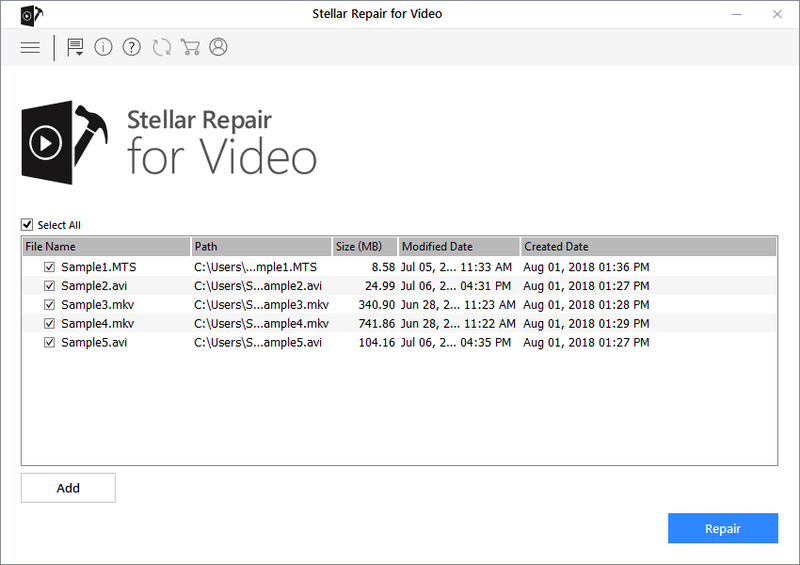 Run the demo version of Stellar Repair for Video software. If you don’t have the activation key, click Get it now button in the window to purchase the software. Once the order is confirmed, an Activation Key is sent to the email that you have provided while purchasing the software. Paste or type the Activation Key (received through email after purchasing the product) and click Activate button (Please ensure an active Internet connection). Stellar Repair for Video automatically communicates with the license server to verify the entered key. If the entered key is valid, activation is completed successfully. ‘Activation Completed Successfully’ message is displayed. Click OK.
Update feature available in Stellar Repair for Video allows you to check and install the latest updates for the application. That will help you keep your application up-to-date. If updates are available for the product, update wizard pops up while you run Stellar Repair for Video. 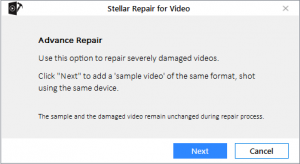 Run Stellar Repair for Video. On the Tools menu, click Update button . If updates are available, Update window is displayed. Click Update and the software will download the files from the update server. When the process is complete, the software will upgrade to the latest version. 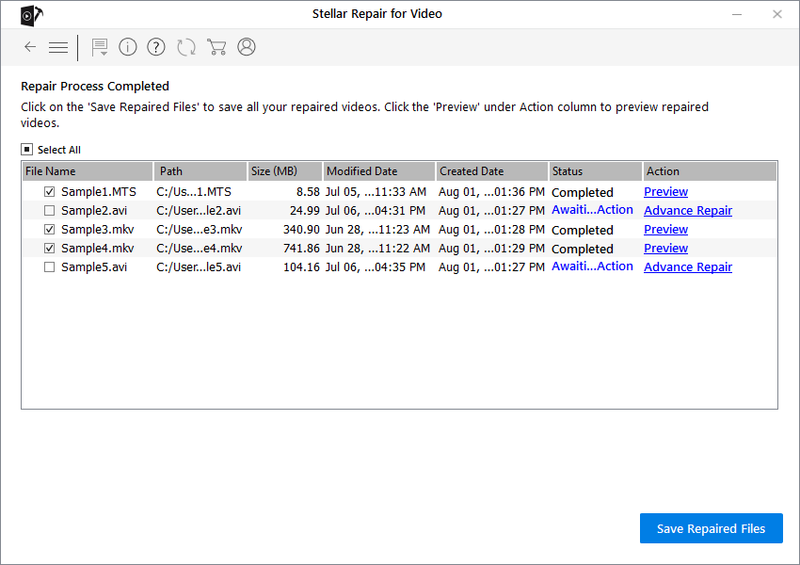 Stellar Repair for Video allows you to repair individual or multiple videos in a single instance. From the main screen, click ‘Add File’ button to add the files for repairing. An Add File dialog box appears. Browse to add required videos to the list. You can add multiple files for repairing. Selected videos get displayed as a list in the software. Select the desired files to repair by clicking on their respective checkbox. You can click on Add button to add more files to the list. Once you have successfully added the files to the list, you can repair, preview and save them to the desired location. To repair the chosen files, click button. Repairing of the selected files is performed by the tool. A progress bar indicates the repairing progress of the file. In case you want to stop the ongoing process, click Stop button. You can view the status of the repaired files from the List of Video Files screen. The files which get repaired successfully are displayed with the Completed status. The files which are highly damaged needs advance repairing. These files display ‘Awaiting Action‘ status. Click Advance Repair to know more about this. If you stop the repairing process, the ‘Aborted ‘ status gets displayed. A ‘Repair process completed’ message appears. To preview the video file, click the Preview button under the Action attribute. Note: In the demo version of the software, the application shows the partial preview of the repaired files. In case your video file is severely corrupted, the application allows you to repair it by adding a Sample File to it. The Advance Repair feature is available only for the files with the ‘Awaiting Action‘ status. A Sample File is a working file created from the same device and of the same format as of the corrupted file. However, it can be of any size. 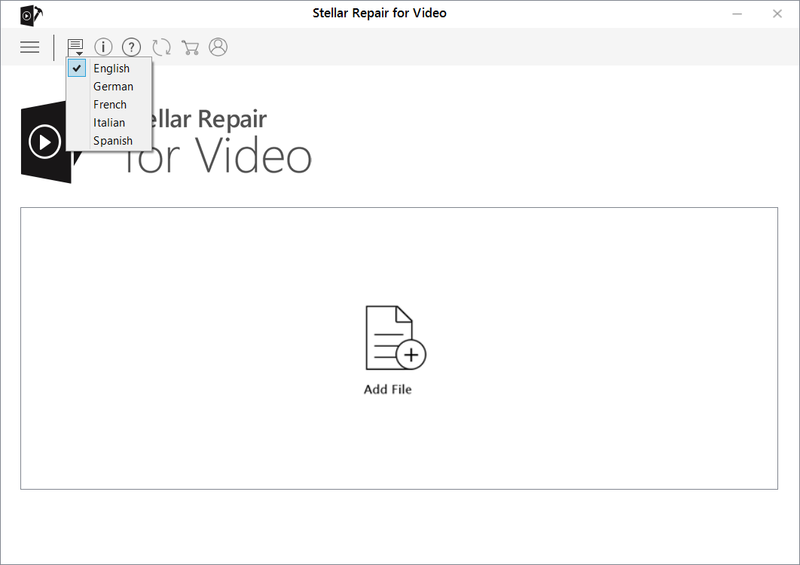 Stellar Repair for Video uses the information from the working sample file and repairs the corrupted file. It also repairs the videos whose data headers are corrupt. From the list of video files, click Advance Repair link under the Action attribute. A dialog box appears. Click Next. Click Browse and select the required Sample file from the location. Select the option ‘Apply to all files of same format‘ to use the selected sample file for repairing all the corrupted video files in the list. Click Repair button to start the repairing process. A progress bar indicates the repairing progress of the file. In case you want to stop the ongoing process, click the Stop button. A ‘Repair process completed’ dialog appears. From the list of repaired files screen, select the desired files to save by clicking on their respective checkbox. Click Save Repaired Files button. Select ‘Save repaired file at source location‘ if you want the file to be saved at the source location OR select ‘Save file at custom location‘ if you want to save the file at your desired location. Click Browse and select the location for saving the video file. Click Save A progress bar indicates the saving progress of the file. A ‘Repaired files saved successfully‘ message appears. Click OK to close the message box. In order to use Stellar Repair for Video software in your preferred language, the application provides an option to select any of the desired language. Using the Languages button on the main user interface, you can change the entire application to a different language at any time/instance without having to re-install the application. On the main user interface, click the Language option. From the options displayed, select the required language. Note: The application supports the following languages: English, French, German, Italian and Spanish. Demo version of the software allows the partial preview of the video file. To repair or save the files, you need to purchase and register the software. How much time will the software take to repair the files? The time taken for repairing the Video files is dependent on the size and number of Video files selected. Will the software make any changes to my Video file while repairing? No. After the repairing process gets completed, you can save the repaired file either at the source location or at your desired location. Will the repaired Video files run on Mac too? 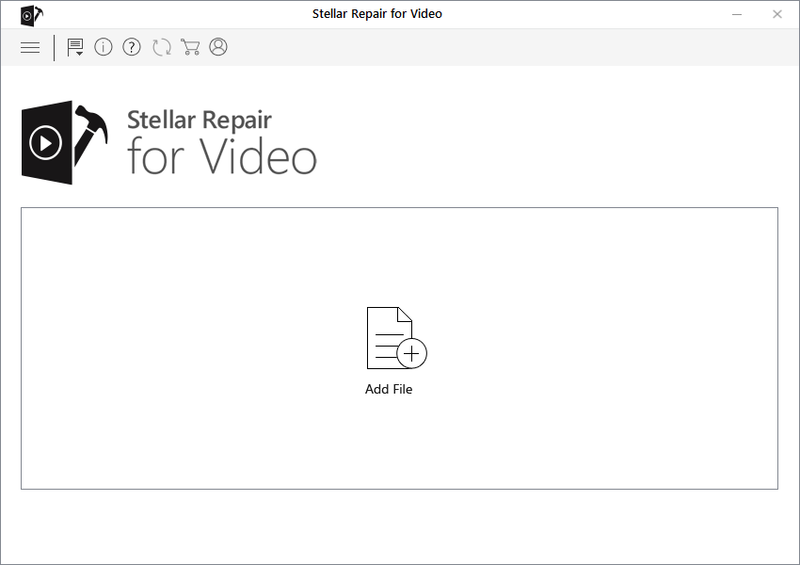 Yes, you can view the files on Mac system which are repaired using Stellar Repair for Video. Stellar Repair for Video software, accompanied user manual and documentation are copyright of Stellar Information Technology Private Limited with all rights reserved. Under the copyright laws, this user manual cannot be reproduced in any form without the prior written permission of Stellar Information Technology Private Limited. No Patent Liability is assumed, however, with respect to the use of the information contained herein. Copyright © Stellar Information Technology Private Limited. All rights reserved. The Information contained in this manual, including but not limited to any product specifications, is subject to change without notice. STELLAR INFORMATION TECHNOLOGY PRIVATE LIMITED PROVIDES NO WARRANTY WITH REGARD TO THIS MANUAL OR ANY OTHER INFORMATION CONTAINED HEREIN AND HEREBY EXPRESSLY DISCLAIMS ANY IMPLIED WARRANTIES OF MERCHANTABILITY OR FITNESS FOR ANY PARTICULAR PURPOSE WITH REGARD TO ANY OF THE FOREGOING STELLAR INFORMATION TECHNOLOGY PRIVATE LIMITED ASSUMES NO LIABILITY FOR ANY DAMAGES INCURRED DIRECTLY OR INDIRECTLY FROM ANY TECHNICAL OR TYPOGRAPHICAL ERRORS OR OMISSIONS CONTAINED HEREIN OR FOR DISCREPANCIES BETWEEN THE PRODUCT AND THE MANUAL. IN NO EVENT SHALL STELLAR INFORMATION TECHNOLOGY PRIVATE LIMITED, BE LIABLE FOR ANY INCIDENTAL, CONSEQUENTIAL SPECIAL, OR EXEMPLARY DAMAGES, WHETHER BASED ON TORT, CONTRACT OR OTHERWISE, ARISING OUT OF OR IN CONNECTION WITH THIS MANUAL OR ANY OTHER INFORMATION CONTAINED HEREIN OR THE USE THEREOF. Stellar Repair for Video® is a registered trademark of Stellar Information Technology Private Limited. Windows 7®, Windows 8®, Windows 8.1®, Windows 10® are registered trademarks of Microsoft® Corporation Inc.
FFmpeg is a trademark of Fabrice Bellard, the originator of the FFmpeg project. All other brands and product names are trademarks or registered trademarks of their respective companies. All product names mentioned herein are the trademarks of their respective owners. This license applies to the standard-licensed version of Stellar Repair for Video. You should carefully read the following terms and conditions before using, installing or distributing this software, unless you have a different license agreement signed by Stellar Information Technology Private Limited. If you do not agree to all of the terms and conditions of this License then do not copy, install, distribute or use any copy of Stellar Repair for Video with which this License is included, you may return the complete package unused without requesting an activation key within 30 days after purchase for a full refund of your payment. The terms and conditions of this License describe the permitted use and users of each Licensed Copy of Stellar Repair for Video. For purposes of this License, if you have a valid single-user license, you have the right to use a single Licensed Copy of Stellar Repair for Video. If you or your organization has a valid multi-user license, then you or your organization has the right to use up to a number of Licensed Copies of Stellar Repair for Video equal to the number of copies indicated in the documents issued by Stellar when granting the license. Each Licensed Copy of Stellar Repair for Video may either be used by a single person or used non-simultaneously by multiple people who use the software personally installed on a single workstation. This is not a concurrent use license. All rights of any kind in Stellar Repair for Video, which are not expressly granted in this license, are entirely and exclusively reserved to and by Stellar Information Technology Private Limited. You shall not rent, lease, modify, translate, reverse engineer, decompile, disassemble or create derivative works based on Stellar Repair for Video nor permit anyone else to do so. You shall not make access to Stellar Repair for Video available to others in connection with a service bureau, application service provider or similar business nor permit anyone else to do so. Stellar Repair for Video and all accompanying software, files, data and materials are distributed and provided AS IS and with no warranties of any kind, whether expressed or implied. You acknowledge that good data processing procedure dictates that any program including Stellar Repair for Video must be thoroughly tested with non-critical data before there is any reliance on it and you hereby assume the entire risk of all use of the copies of Stellar Repair for Video covered by this License. This disclaimer of warranty constitutes an essential part of this License. In addition, in no event does Stellar authorize you or anyone else to use Stellar Repair for Video in applications or systems where its failure to perform can reasonably be expected to result in a significant physical injury or in loss of life. Any such use is entirely at your own risk and you would not hold Stellar responsible for any and all claims or losses relating to such unauthorized use. In no event shall Stellar Information Technology Private Limited or its suppliers be liable for any special, incidental, indirect, or consequential damages whatsoever (including, without limitation, damages for loss of business profits, business interruption, loss of business information, or any other pecuniary loss) arising out of the use of or inability to use the software product or the provision of or failure to provide support services, even if Stellar Information Technology Private Limited has been advised of the possibility of such damages. In any case, Stellar Information Technology Private Limited’s entire liability under any provision shall be limited to the amount actually paid by you for the software product. This License is the complete statement of the agreement between the parties on the subject matter and merges and supersedes all other or prior understandings, purchase orders, agreements and arrangements. This License shall be governed by the laws of the State of Delhi, India. Exclusive jurisdiction and venue for all matters relating to this License shall be in courts and fora located in the State of Delhi, India and you consent to such jurisdiction and venue. There are no third party beneficiaries of any promises, obligations or representations made by Stellar herein. Any waiver by Stellar of any violation of this License by you shall not constitute nor contribute to a waiver by Stellar of any other or future violation of the same provision or any other provision of this License.